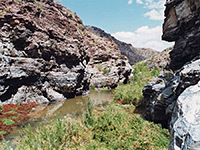 The scenic upper canyon of the Bill Williams River may be accessed from the road to Alamo Lake State Park, near Alamo Dam. Soon after the gate near the end of this road, the route forks; one branch crosses the top of the dam while the other winds down around cliffs and through an open area, finally ending where the canyon begins to narrow, about 1 mile from the gate. Nearby is a gaging station and remains of a cable car crossing of the river. A path continues, initially along a sandy bank above the river, which soon passes a nice narrow side canyon on the left then enters a section of 50 meters or so with mostly vertical walls and deepish water. To continue, one option is to wade or at times swim through the river, but the water is not very clean and smells bad, supposedly due to farming wastes concentrated in the reservoir then released from the dam, and also has patches of deep, soft mud. So, climbing rocks at either side is probably best, and this is easiest on the right as on the left the cliffs are higher and more vertical. Both sides have occasional old wooden ladders leading to tunnels, relics from mining activities early last century. The canyon beyond becomes up to 600 feet deep but stays generally quite wide, with sand and pebble banks beneath the cliffs - plenty of places good for camping, grassy areas and bushes closer to the waters edge, and many cacti growing on the rocky hillsides. An easy and reasonably well-used path follows the river on the south, although some rockier sections need a little climbing, and/or crossing to the other side. Occasional V-shaped side canyons join, and the character remains similar for about 5 miles, where the hills recede and the river enters a much wider valley. 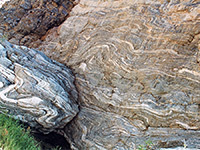 The rocks are metamorphic and rather weathered, with interesting colors, patterns and textures. 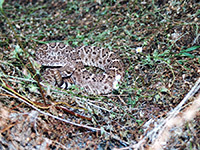 The canyon is the main attraction of the Rawhide Mountains Wilderness, a 38,000 acre expanse of remote peaks and ravines.